Once you have exchanged your voucher at Gray Line CitySightseeing New York Visitor Centre, you can board the double-decker bus from any of the stops. Explore all the excitement that New York City has to offer with this fantastic FreeStyle Pass New York package. For one low price you get 3 days use of the New York hop-on, hop-off bus – plus 3 or 5 tickets that can be used at attractions, tours or restaurants which take your fancy. See all the sights of the Big Apple with your hop-on, hop-off ticket which is valid for 72 hours. 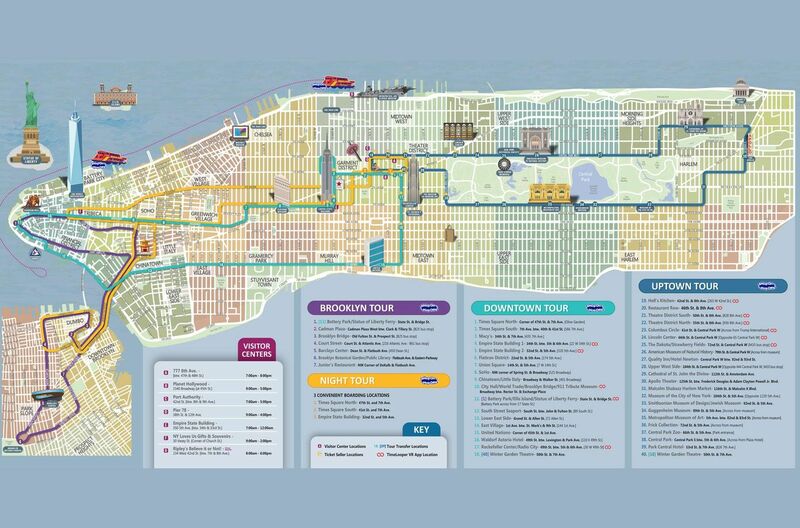 The tour takes four routes – Downtown, Uptown and Brooklyn, covering all the major attractions of New York. With your ticket you can hop on and off these routes as much as you wish. Also, see the New York City dazzling under the night sky and explore its major highlights accompanied by a guide with the New York City Night Tour. Plus with this great package you get a choice of 3 or 5 options which can be used at any location. enjoy lunch in Little Italy and much more. You can also opt for VIP Pass, which allows priority boarding at all stops on the double-decker buses and CitySightseeing New York Cruises. Explore the Big Apple at your own pace with the fantastic-value FreeStyle Pass which combines 72 hours hop-on, hop-off tour access, plus 3 or 5 additional New York attractions of your choice. Depending on which package you opt for, you will have access to five bus tours plus your choice of 3 or 5 attraction tickets. Your options may include below attractions plus over other 40 choices! The Free Museum ticket is only valid for entrance into the Museum of the City of New York or New York Historical Society. The New-York Historical Society is closed on Mondays. During the holiday season the Night tour will be replaced by a "Light of the Holiday" tour (1.5 hours), featuring animated window displays & holiday decorations at New York's famous department stores, giant tree at Rockefeller Center and Manhattan’s other unique sights during holidays. Tickets are valid from the time you redeem your voucher at the Gray Line CitySightseeing New York Visitor Centre. Tickets for attractions and City Sightseeing Hop-on, Hop-off Ferry are valid as indicated on ticket stub. Museum of Modern Art (MoMA) will be closed for scheduled maintenance from 16 Jun 19 to 21 Oct 19. During this time, MoMA will not be a choice in the FreeStyle Pass. marked with the symbol and disabled customers can board them at any of our stops. These buses have ramps and securement for two wheelchairs on the lower level. The staff at the main center did not inform us that Hop-On, Hop-Off Tour buses only ran until 5 p.m. We were stuck around the World Trade Center waiting and not knowing that buses didn't run past 5 p.m. If we knew this information from the beginning we would have managed our time for sight seeing better and/or not waited around for a bus that was not coming. We were able to go to all the places we wanted to with no problems. The ferry was well worth it! We had a really great time! You need to pay very close attention to which attractions are being offered and that the info is up-to-date. We read online and called the Isango customer service to make sure that the Empire State building was one of the attractions offered, but when we went to the Empire State Building, they no longer accepted the vouchers. Sure enough, when I looked at the brochure closer, it was no longer an offered attraction. Everything listed on the updated brochure, given to us upon check-in, when we received our tickets was accepted, however. We had a really great time and it was super easy to use the vouchers. We would definitely buy this option again!